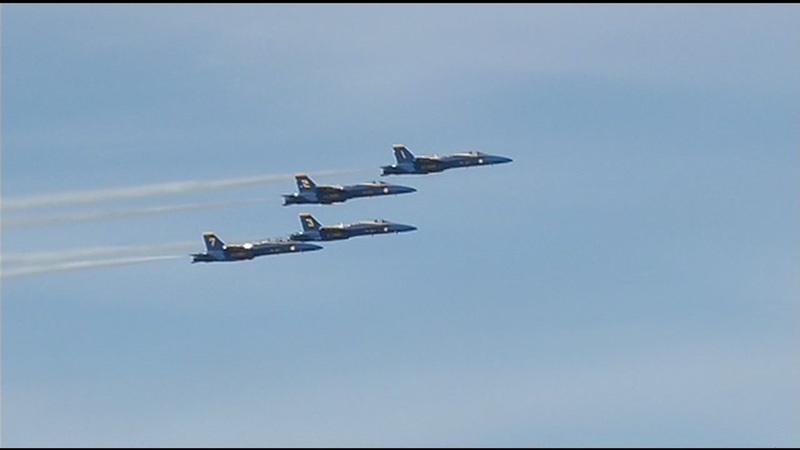 SAN FRANCISCO (KGO) -- The Blue Angels are practicing above and around San Francisco on Thursday afternoon. The US Navy stunt pilots are practicing from 1 p.m. to 5 p.m. ahead of three weekend shows as part of Fleet Week. The Blue Angels will be doing what's called a survey flight during practice. The Blue Angels are celebrating their 70th anniversary this year, event organizers said. They will then perform their signature moves Friday, Saturday and Sunday from 3 p.m. to 4 p.m. during the Fleet Week air show. The weekend air shows are from noon to 4 p.m. over the city's waterfront. This week's events also include a veteran art exhibit at The Cannery at 2801 Leavenworth St., various performances by the U.S. Navy Pacific Fleet Band at multiple locations, as well as tours of several military ships. A festival at the Marina Green is scheduled for Friday, Saturday and Sunday from 10 a.m. to 5 p.m.
On the final day, Oct 10, Fleet Week will conclude with a High School Band Challenge at the Band Shell at Golden Gate Park. The challenge will feature dozens of high school bands and benefits arts programs at local high schools, Fleet Week officials said. Fleet Week began in 1981 and takes place every October, attracting thousands of visitors and generating over $10 million in revenue for the city, according to Navy officials. Click here for information about the multiple events scheduled during Fleet Week. Click here for a full list of Fleet Week events.